Wills: Drafting a will describing how you wish to distribute your estate at the time of your death can spare your loved ones a great deal of time, stress and additional costs. 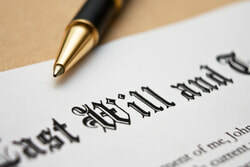 Without a will, your estate may be subject to additional fees, taxes and litigation. Power of Attorney: In the event that you are no longer able to make decisions on your own, a Power of Attorney dictates who can make decisions on your behalf. These decisions can be limited to specific situations or cover a range of subjects such as medical care and property management. Estates: If your loved one has passed away, there are many steps that may need to be taken depending on the circumstances. Probate or Letters of Administration may be necessary, trusts may need set up, land titles may need changed, and more. Settling the estate properly is important to minimize costs and reduce the risk of family members disputing how to handle the property. Regent Law can provide you with guidance on settling an estate or determining if an estate is being handled appropriately. Trusts: Trusts are set up for the benefit of one person (the beneficiary), and controlled by another person (the trustee). Regent Law offers advice on how best to structure a trust and we can draft the trust for you.